Hello everyone, and thanks for the feedback that you guys have given me after the previous price point article. I’ve taken in your feedback and constructive criticism, and I hope that this article reflects that! However, I would like to clarify that this series is not written to be a comprehensive list/shopping guide for watches under a certain price point – the watches curated here reflect my own taste, and are what I personally would buy given the money. If I had $1000 to spend on a watch, I definitely would not spend it on a SevenFriday. Nevertheless, this is my personal opinion – if you own a SevenFriday, or are a SevenFriday fan, it just means that our taste in watches differ. Nothing wrong with that! Currently, you can find the SevenFriday P series on Lazada for a little over $1000. So why do I not like SevenFriday? Firstly, I think you’re not getting your money’s worth in terms of build quality. Spec-wise, it uses mineral glass instead of sapphire, utilizes the Miyota 82S7 movement (which stutters), and has only a paltry WR rating of 30M. The strap is nothing to shout about either. On paper, the build quality of the SevenFriday P series is equivalent (perhaps even worse) to $200 Seiko 5s and Orients. If you’re reading this and own a SevenFriday watch, the avant-garde design is probably what prompted you to purchase the watch. Personally, I’m not a big fan of the design (I prefer a more classic look), but I can understand why it does the trick for some. Nevertheless, $1000 is quite significant – you should be getting a watch that can last you a long time. When you buy a watch for its “trendy” design, the danger is that while it may look cool now, there’s no guarantee that it will continue to do so 5 or 10 years from now. That’s the inherent nature of fashion. In fact, while SevenFriday watches were all the rage a few years ago (plastered on magazines and Instagram everywhere), the hype is already diminishing. I can’t say with confidence that SevenFriday is a watch brand that will be relevant in the next decade, and thus would be hesitant in splashing $1000 on a SevenFriday. With that said, let’s move on to the watches that I personally would buy with the money! The SARX049 is currently on sale for $758USD (~S$1000) on www.seiyajapan.com. This is my top pick, and would probably be what I would personally buy with $1000. You’re getting a lot for your money – sapphire all around (dial and caseback), Seiko’s excellent in-house 6R15 movement (a step up from the 4R15 found in lower-ended presages like the cocktail time), a crocodile strap, and an absolutely beautiful enamel dial. The WR rating is a respectable 100m as well, so you wouldn’t have to worry about it after being caught in the rain or an accidental mishap with coffee. I believe (correct me if I’m wrong) that Seiko produces the most affordable enamel dial watches in the market. After the previous article, a lot of readers clamored for the inclusion of a diver watch. I personally am not a big fan of divers (I’m not really a sporty or outdoor loving person), so I apologise in advance as divers will not be heavily featured in this price point series. As aforementioned, the watches curated in these articles reflect my personal taste. 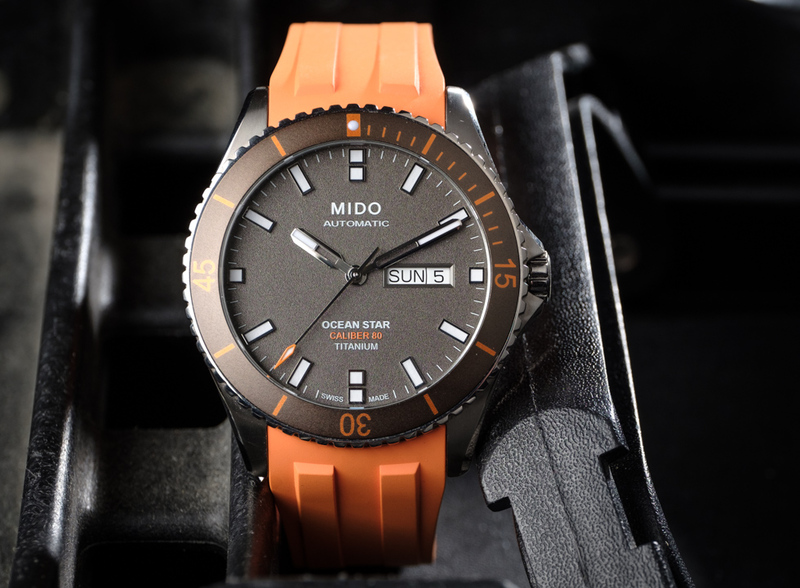 That being said, the Mido Ocean Star is by far my favourite affordable diver watch. I love the design – the applied indices, the flame-tipped second hand, the sand-blasted dial, the day-date indicator, everything. Inside, the impressive Mido Caliber 80 (Mido’s version of Tissot’s Powermatic 80 movement) powers the watch, giving the watch an impressive 80 hours of power reserve. The one thing I personally dislike about divers is usually the heft. That’s not the case (literally) here, as the case (and the bracelet on the bracelet version) is forged out of titanium. This makes the entire watch lightweight despite its size. Titanium on a watch that easily slides under the $1000 price point? Those killer looks and the Swiss-made build quality? If the Seiko is my favourite dress piece, the Mido Ocean Star Titanium would no doubt be my pick for a brilliant sport watch. If you’re in Singapore, Junghans is stocked at Watches of Switzerland, where the Form A can be bought for around $1000. If you’re into the minimalist designs, I personally think that the Junghans Form A is a great choice. The design epitomises German bauhaus aesthetics, giving the Form A a clean, killer look. I love the clean, bold dial of the Form A, especially these little square indentations that serves as minute indices. Personally, the orange numerals variant (pictured above) is my favorite as it gives the dial a pop of color and character. Inside, the ETA 2824 workhorse powers the watch. In addition, you get significant watchmaking history with Junghans, who have been manufacturing watches since 1861. For me, the Junghans Form A would be my sub-$1000 pick for an everyday watch – it looks equally good under a shirt cuff as it does when paired with T-shirt and jeans. A Swiss movement combined with German aesthetics makes for a compelling watch. No wonder Hodinkee named it as their value proposition! $1000 is a sizable amount for me, so I would be looking to pick up a well-built watch with timeless aesthetics. For this reason, I personally would avoid SevenFriday, as I feel that their watches aren’t worth the amount they are charging! Instead, I would go with a established watch maison such as Seiko, Mido and Junghans instead, where the designs would look as good (perhaps even better) years from now. As always, let me know what you guys think of my picks! As I hope I’ve shown, I’m immensely receptive to feedback. The next price point will be $3000 – stay tuned!